Manzanares is south of Madrid in the central region of Castile, an area made famous by Don Quixote. The village was originally occupied by the Druids in 1,000BC, and in 1987 Cave Paintings were discovered in the nearby town of La Pedriza. The drawings date back to the Bronze Age using a red coloured pigment and describe how the people lived at that time with images of farming and cattle. Over the centuries Manzanares grew into a very impressive garrison town leaving behind a number of fascinating sites to visit. During the 14th century, the Mendoza family, one of Spain's most noblest families, was presented with a Manor house by the King of Spain. When a manor was awarded to a noble it was usual practice to build a fortress town around it. Consequently the construction of a castle began, and you can find this ancient castle close to the old cemetery near the river. It had a square perimeter with four towers at each corner, the fourth being a keep located near the entrance. Only two walls of the castle remain standing, one being the east wall with narrow slit windows used to defend the castle during attacks. In 1475 the construction of a larger and more impressive fortress began, and this eventually became the residence of the Mendoza family. 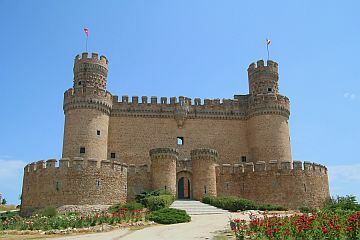 The Mendoza Castle is one of the best preserved medieval fortresses in Spain and one of the last examples of Castile's 15th century military architecture. Surrounded by a lower wall, it has an inner building consisting of six floors. Inside it is decorated with a collection of 17th century tapestries, furniture and military artefacts that date back to that period. Nowadays the castle is used to serve the community, so various public events, exhibitions and concerts are held there throughout the year. There is also an ancient Bridge in Manzanares called Canada Real Segoviana which was originally made out of wood and has been renovated several times over the centuries. It was used by merchants and cattle owners to move their cattle through Spain, and the village generated a great deal of income from the bridge as they charged a toll to cross it. Another interesting place to visit is the 14th century Nuestra Senora de las Nieves Church with its mixture of Romanesque and Gothic styles. Inside the chapel is a beautiful baptism font and tabernacle. On the southern side of town is a slope where you will find La Ermatis Fountain. The fountain dates back to the late 15th century, and was still in use up until 1992. However, it has since been renovated and declared an important monument. The fountain is made of granite with an inscription of the wedding vows made by Don Inigo Lopez de Mendoza to his wife Dona Maria. The Senora de Pena Sacre Hermitage is only 1 km north of Manzanares and located near the Pena Sacra, a sacred stone used by Celtic priests to perform rituals. The building was constructed in the 15th century and was originally meant to be a convent. However, plans were changed and instead it became a chapel. In 1769 during a festival to celebrate the Virgen de Pena Sacre, the candles set the church on fire destroying the roof and other significant sections of it. It was also partially damaged during the Spanish Civil War as well. So it has had to be rebuilt several times over the centuries. During the early 18th century eight watermills were built in Manzanares. Today only the ruins of Molino Caido de Moros and Molino del Cura remain. You will have to head in the direction of Pena Sacra Hermitage to find the Molino del Cura, which was a mill used to provide water for this village as well as other surrounding villages. Grain was stored and ground on the main floor by a hydraulic mechanism on the floor below, and the miller’s house contained accommodation, store rooms and stables. Once again the Spanish Civil War had a devastating effect and the mill ceased to be used sometime afterwards. You will want to take your time while you explore this area, so treat yourself to the Parador Hotel Manzanares. 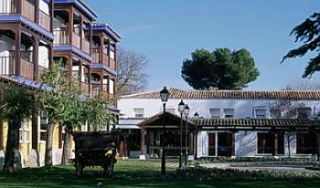 This La Mancha style country house has been converted into a very comfortable three star hotel and is beautifully located in a tranquil setting between the Lakes of Ruidera and the Tablas de Daimiel. It not only has a wonderful restaurant specialising in international and regional dishes, but also an outdoor swimming pool which is a welcome feature during Spain's hot summer months.